Our findings, presented at WISER’s Annual Symposium on September 26th, reveal that open MEPs alone can serve as an important catalyst to increasing minority and African-American plan participation levels, over a generation of savers. However, when open MEPs are paired with auto portability, the result is a dramatic, incremental increase in the preservation of minorities’ retirement wealth. Today, minorities face two fundamental challenges in accumulating retirement wealth: 1) gaining access to an employer-sponsored retirement savings plan and 2) preserving their retirement savings as they change jobs. Minorities are under-represented in America’s defined contribution system, representing about 25% of all defined contribution participants, while accounting for 39% of the general population. By 2060, the U.S. Census Bureau’s National Population Survey projects that minorities will represent 56% of the general population. In 2012, the Department of Labor issued Advisory Opinion 2012-04A, which effectively inhibited the creation of open multiple-employer plans. Since 2013, there have been at least 10 proposals from Congress or the Executive branch that would relax restrictions around open MEPs. An Executive Order, issued 8/31/18, instructing the Department of Labor and the Secretary of the Treasury to propose amendments to regulations or guidance. The Retirement Enhancement and Savings Act (RESA): Unanimously approved by the Senate Finance Committee in 2016 and reintroduced in 2018, RESA includes language on open MEPs very similar to the Family Savings Act of 2018. While the focus of open MEPs policy initiatives is on small- and medium-sized employers – driving down the cost and administrative burden of sponsoring defined contribution plans – the real beneficiaries are American workers. Minorities should disproportionately benefit from the adoption of open MEPs since, according to Small Business Administration (SBA) statistics, racial and ethnic minorities represent over 37% of total small business employment. To understand the potential impact of open MEPs on minorities, Retirement Clearinghouse (RCH) utilized the Auto Portability Simulation model (APS), a discrete event simulation model to predict the effects over a generation of minority savers, including open MEPs scenarios both with and without auto portability, and under two balance thresholds. The APS model assumes that open MEPs produce a rapid growth in participation in small (1-99 employees) and medium-sized (100-249 employees) businesses during the period 2019-2022, where 16.7 million additional, active participants are added to the defined contribution system. This initial, rapid growth serves as a stimulus to gradually increase minority participation levels over time, eventually mirroring the underlying population by the end of the simulation timeframe, in 2058. Under these assumptions, overall minority participation would increase from 16.4 million in 2018, to 52.7 million in 2058. The number of African-American participants would increase from 6.6 million to 14.2 million. The APS then examines what happens to two segments of minority job-changers – those with balances under $5,000 and those with balances under $15,000. Without auto portability, minority job-changers with balances less than $5,000 cash out 70% of the time, totaling $140 billion, in today’s dollars. Those with balances below $15,000 fare no better, with 105 million cashouts totaling $500 billion. By contrast, with auto portability, 84 million - 73% of minority job-changers with balances less than $5,000 - will preserve their retirement savings, incrementally accumulating $362 billion in retirement wealth. If the threshold is increased to $15,000, the numbers increase to 129 million job-changers (77%), with $1.4 trillion in retirement wealth preserved. 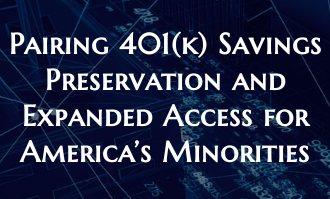 While our simulation model predicts that expanded access initiatives, such as open MEPs, can play an important role in increasing minority and African-American participation in defined contribution plans, it also indicates they could fall short in preserving their retirement wealth. However, when paired with auto portability, the combination of increased participation with savings preservation produces dramatic increases in minorities’ retirement wealth. These results have important retirement public policy implications. To increase retirement security for all Americans -- including minorities and African-Americans – it will be vitally important to pair expanded access with auto portability.